Trekking permit is required for trekking in certain areas of Nepal. Nepal government has regulated the rules and regulations by issuing permits to do the activities in these areas. The areas are preserved under of National Parks and Conservation Areas. To enter and performed allowed activities, a valid permit is compulsory for every foreigner. The fees and rules are based on the areas where you want to travel. Regular permits can be issues by providing the valid passports copy and two photographs to the offices on working days. However some area needs special permits, in this case different requirement should be followed. 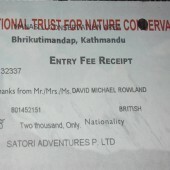 Satori Adventures arranges permits for your holidays. Upon you arrival in Nepal, we schedule the time for permit if your compulsory presence is required otherwise after you provide the documents, we arrange the permit. TIMS, Trekking permits are compulsory for popular trekking area like Everest, Annapurna, Langtang and special permits required for Upper Mustang, Dolpo, Manaslu, Makalu, Kanchenjunga and some of the important part of the country. To be an environmental friendly, we request all trekkers/travelers to follow these guidelines during your holidays. Also to avoid the uncertain problems in the mountain areas be prepare before your departure. We recommend that each trekker have to kept a small bag during the course of the trip. Each morning a small fire is lit for burnable rubbish. Any non-burnable or non-biodegradable rubbish should be carried back to Kathmandu and disposed appropriately. Always carry Nepalese rupees for small bills on your trek. The amount to be cared depends on the area and the duration of the trek. A guideline for this will be presented during our trek briefing. Money will only be required for the purchase of soft/hard bottled drinks and souvenirs along the way. Other money and valuables should be kept in a safe deposit box in your hotel in Kathmandu. Per week per person US$ 10 Or equivalent convertible foreign currency. For the first 10 days per person US $500 and After 10 days per day per person Us$50. From September to November per week per person US$ 70 and After 7 days per day per person US$ 10.and From December to August per week per person US$ 50 and After 7 days per day per person US$ 7 /Or equivalent convertible foreign currency. From September to November per person US$35 for first 8 days and from December to August per person US$25 for first 8 days or equivalent convertible foreign currency. For the first 7 days per person US$ 50 and After 7 days per day per person US$ 7 Or equivalent convertible foreign currency. per week per person US$ 10, Or equivalent convertible foreign currency. For the first 4 weeks per week per person US$ 10 and After 4 weeks per week per person US$ 20, Or equivalent convertible foreign currency. From September to November per week per person US$ 90 and December to August per week per person US$ 75 Or equivalent convertible foreign currency. For the first 7 days per person US $90 and After 7 days per day per person Us$15 Or equivalent convertible foreign currency..